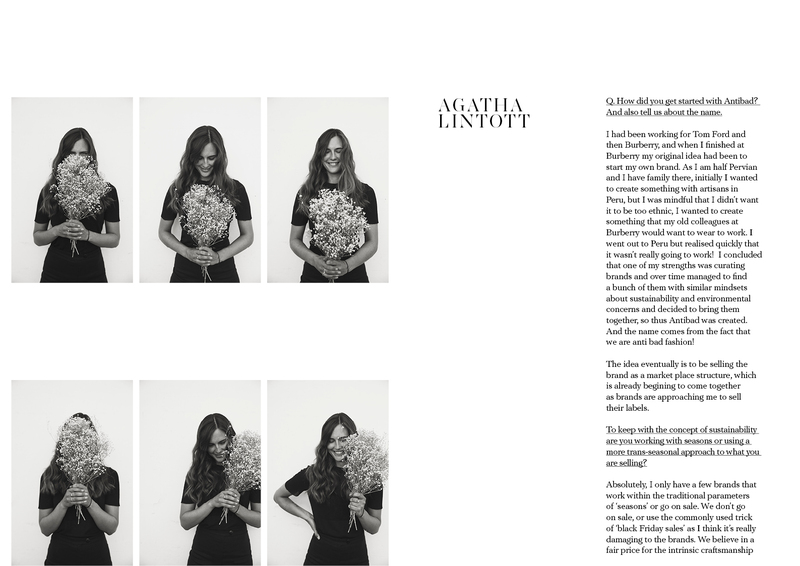 Make magazine chats to Agatha Lintott the woman responsible for Antibad an innovative new website that curates and champions brands that are as chic as they are environmentally sound. The first ‘green’ online boutique. Q. How did you get started with Antibad? A. I had been working for Tom Ford and then Burberry, and when I finished at Burberry my original idea had been to start my own brand. As I am half Peruvian and I have family there, initially, I wanted to create something with artisans in Peru, but I was mindful that I didn’t want it to be too ethnic, I wanted to create something that my old colleagues at Burberry would want to wear to work. I went out to Peru but realised quickly that it wasn’t really going to work! I concluded that one of my strengths was curating brands and over time managed to find a bunch of them with similar mindsets about sustainability and environmental concerns and decided to bring them together, so thus Antibad was created. And the name comes from the fact that we are anti bad fashion! The idea eventually is to be selling the brand as a marketplace structure, which is already beginning to come together as brands are approaching me to sell their labels. Q. To keep with the concept of sustainability are you working with seasons or using a more trans-seasonal approach to what you are selling? A. Absolutely, I only have a few brands that work within the traditional parameters of ‘seasons’ or go on sale. We don’t go on sale or use the commonly used trick of ‘black Friday sales’ as I think it’s really damaging to the brands. We believe in a fair price for the intrinsic craftsmanship of what we are selling. The idea of sales makes people consume fashion in a less responsible way as they often buy things because they are cheap and not because they really love them or they have a valid place in their wardrobe. Also, fashion does work cyclically. There might be a time when you don’t want to wear something but I think if you have bought consciously you will probably feel inspired to wear it in the future again. Women on average only wear 20 percent of their wardrobe and I think that is a great shame and something we should be addressing. Q. How do you quantify the ‘green’ attributes that a designer needs to be adhering to in order for it to make it on the Antibad website? A. Fair-trade should be the requirement but it’s an expensive process to be listed legally under this certification, therefore most of the designers I work with do so in the way that would make them officially fair-trade. This means that they are small and they know every single person who makes their clothes by name. They pay fair wages, they have a culture of respect for their workers. The other side of it is the materials used: the dyes, the fabrics, whether they are using dead-stock fabrics. There are no set rules about what makes a brand ethical exactly and there are compromises. What I am looking for, above all, is transparency about all of their working practices so that one can give the customer the choice about how they want to invest their money in fashion and what aspects are important to them. Do they want to buy locally? Do they want to buy recycled fabrics? Does it need to be vegan? That is why we shop by a filter on the site so that the customer can narrow down their choices by the parameters which are closest to their hearts in terms of environmental concerns. The minimum for the site is that the workers are treated within the rules of fair-trade, there are no virgin polyesters or toxic dyes used and it has to be as close to carbon neutral as is possible. It is difficult and sometimes it feels overwhelming as customers feel like they can’t do anything ‘right’ in terms of ticking all the boxes for ethical purchases. An important reason why people respond to the site as the consumer is able to show with their money what ethical cause they want to support. Q. 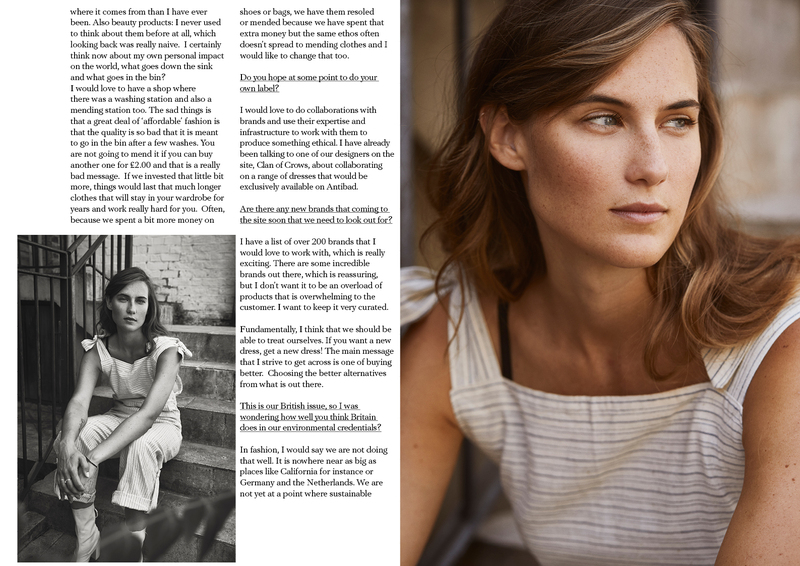 For you, what are the biggest issues surrounding ethical fashion? A. People and their treatment is one of my primary concerns. There are laws out there to protect workers in terms of minimum wage and slavery, but I don’t think that the government puts enough pressure on business to manage that properly and really invest in it. There are some very big companies with corporate social responsibility teams and they have sustainability teams. I met with someone who worked in one of those teams and she said that although they try their hardest, they don’t know one hundred percent if their products are ethical as the businesses are too large to police properly. I think that the government really need to do something to support big business to make sure that the products are ethical. Q. What do you think about the way the media in general talks about fashion? A. I think we need to re-address the way that it is spoken about in all areas of media. Change the subject from newness, and that is tricky as a lot of these business rely on consumption. However, I do think that something needs to be addressed when some fashion businesses are bringing out sixty collections a season! I am trying to address that as well as ultimately, I am a shop, and I do want people to purchase things! I am doing that by hoping that I am encouraging people to really think about what they are buying. I would like to encourage people to shop for quality rather than quantity. Even in the way we portray our products on the site for example, we don’t use models. We use people who are involved in activism in some way, so they truly represent the brand. Q. You have vintage pieces on the site, how do you about finding those pieces? Do you source them personally? A. There is a vintage wholesaler that I work with and I tend to buy everything from there. They find their vintage in Italy and then I curate special pieces for the site. It was always important for me to include vintage as I think it’s probably the most sustainable way to shop. They are often really special pieceshand made, that often go up in value as they are unique. Q. Who or whatare the worst offenders in fashion? A. Leather and denim are some ofthe worst polluters in the world: They use toxic dyes that flood into the water systems as well as consuming a lot of water; by and large, they are very unethical in their practices. The leather we have on the site is all vegetable tanned and a by-product of the food industry. We use denim from brands like Happy Haus, that are made from 100% washed denim that’s been DETOX certified and Greenpeace approved. Q. Has all this awareness led you to more ‘green’ in other areas and practices of your life? A. I am certainly trying. I have learned a lot from all the people I have met on this journey, soI try to use this knowledge in all areas of my life. Things like plastic are now very important to me, whereas before I don’t think I really thought too much about it. I am definitely a lot more conscious about what I am eating and where it comes from than I have ever been. Also, beauty products: I never used to think about them before at all, which looking back was really naive. I certainly think now about my own personal impact on the world, what goes down the sink and what goes in the bin? I would love to have a shop where there was a washing station and also a mending station too. The sad things is that a great deal of ‘affordable’ fashion is that the quality is so bad that it is meant to go in the bin after a few washes. You are not going to mend it if you can buy another one for £2.00 and that is a really bad message. If we invested that little bit more, things would last that much longer clothes that will stay in your wardrobe for years and work really hard for you. Often, because we spent a bit more money on shoes or bags, we have them resoled or mended because we have spent that extra money but the same ethos often doesn’t spread to mending clothes and I would like to change that too. Q. Do you hope at some point to do your own label? A. I would love to do collaborations with brands and use their expertise and infrastructure to work with them to produce something ethical. I have already been talking to one of our designers on the site, Clan of Crows, about collaborating on a range of dresses that would be exclusively available on Antibad. Q. Are there any new brands that coming to the site soon that we need to look out for? I have a list of over 200 brands that I would love to work with, which is really exciting. There are some incredible brands out there, whichis reassuring, but I don’t want it to be an overload of products that is overwhelming to the customer. I want to keep it very curated. Fundamentally, I think that we should be able to treat ourselves. If you want a new dress, get a new dress! The main message that I strive to get across is one of buying better. Choosing the better alternatives from what is out there. Q This is our British issue, so I was wondering how well you think Britain does in our environmental credentials? In fashion, I would say we are not doing that well. It is nowhere near as big as places like California for instance or Germany and the Netherlands. We are not yet at a point where sustainable fashion is mixed in with normal fashion. In the media, we are still always lumped into featureson sustainability and these brands don’t appear in the fashion pages. Whereas in those other countries it’s being worn by influencers or celebrities and it is more commonplace. They are not necessarily buying something because it’s sustainable, it’s more that it is just really beautiful. I think we have a few years to go before we catch up. There are some great brands starting up, but a big problem is that we don’t have the resources to make things ethically in the same way that they do. In some countries, they have the ability to grow, weave, dye and manufacture all in one country, which in itself is a way of being more ethical in clothing production. We are lacking that infrastructure in this country. Q. Do you have any simple advice for anyone trying to be a bit more ethical in their fashion choices that might make it a bit easier for them? A. Don’t become overwhelmed with trying to do everything at once. I have friends that come to me feeling guilty about their purchases all the time. I try to placate them and tell them that it is fine, but maybe next time, try to do their research. Spend a bit more time and don’t buy on impulse or on a whim. Don’t also feel that you have to throw away all your ‘bad fashion’ as that only compounds the problem. I have things in my wardrobe from Zara or H&M from years ago and I am not going to throw them away. But now I only buy sustainably and gradually my wardrobe has evolved. I find that I value my purchases more when I have researched them and know that they have good credentials and now I really wouldn’t get the same gratification that I used to from buying from a high street brand. In a nutshell, cherish what you have, mend things, alter things. When you decide to get rid of something think about how you are going to dispose of it.